Scientists from St Petersburg's Arctic and Antarctic Research Institute are developing new technologies that will help protect Russian oil rigs. New technologies developed by Russian scientists will make it possible to forecast the movement of ice floes in the Arctic by several days in advance. In cases when ice floes present a danger, scientists will be able to divert them away from oil rigs. The new technologies will be tested as early as 2016 in the Spitzbergen archipelago and in the Barents and Kara seas. That is where Russian companies are busy exploring and developing oil and gas fields. Dealing with the consequences of an oil spill, even in warm waters such as the Gulf of Mexico, is fraught with numerous difficulties. In the Arctic a spill would be even more difficult to clean up. One of the main dangers in northern climates is the threat from ice, such as ice fields, icebergs and their fragments. Every year, thousands of ice floes break off from the ice caps of the archipelagos of Spitzbergen, Franz Joseph Land, and Novaya Zemlya. An iceberg can weigh several million tons, and a collision would easily destroy an oil rig. The movement of icebergs can be forecasted and managed with the use of modern technologies developed especially for Arctic conditions, and which are already available in Canada. In Russia, however, such technologies are currently under development by a group of scientists from the St. Petersburg-based Arctic and Antarctic Research Institute (AANII). How to prevent a disaster? It is necessary to predict iceberg movement several days in advance. According to scientists, the main challenge is to spot an ice flow with the use of satellites, UAVs, or aviation and to calculate its trajectory on the basis of an algorithm that, in addition to the parameters of the iceberg, takes into account atmosphere dynamics, and water and ice dynamics. As soon as it becomes clear that an iceberg is coming dangerously close to an oil rig, icebreakers are directed to the scene. With the help of special nets and cables, they will pull the iceberg to a safe distance so that it does not re-enter the area. Scientists are now developing a system that consists of hardware and software. According to Danilov, Russian scientists already gained substantial experience in iceberg management in the summer of 2014 during drilling exploration in the Kara Sea when an oilfield called Pobeda (Russian for “victory”) was discovered. 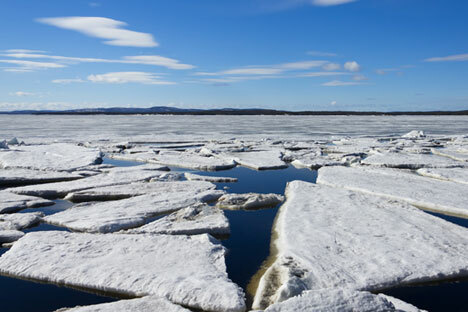 As part of this project, the scientists are also developing monitoring instruments to forecast climate change, land and water pollution, as well as dangerous geo-dynamic phenomena typical of the Arctic continental shelf and coast.